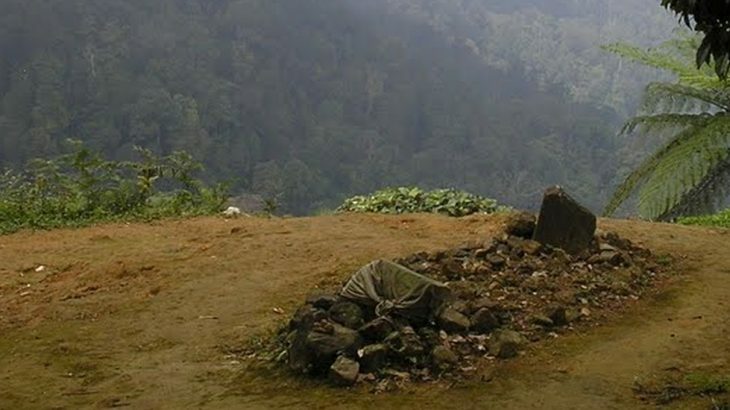 Sangga Buana is a small mountain 32km south of Karawang, popular with local villagers who often pray on its slopes. There is even a sign for the mountain just below Jembatan Badami (an hour from Jakarta on the bus route from Kampung Rambutan to Karawang). The bumpy road (which is currently being resurfaced in several sections – July 2010) leads along the banks of the Badami river, through small villages, increasingly delightful West Java countryside and eventually up into the hills. One of the most interesting peaks is rocky little Rongking to the right of the road, which become visible a few kilometres before Sangga Buana basecamp (141m) at Kampung Cipeuteuy. Just like the nearby mountains east of the Jatiluhur reservoir, the area is fascinating and remarkably unknown given how close it is to Jakarta. The basecamp itself is on the left across a small stream/drain and up some steps. It is a good idea to go in and register and ask for a guide if you need one. Sangga Buana is by no means the only attraction in the area – there are numerous waterfalls and many local Indonesian students come to visit the more accessible ones at weekends. Curug Cikoealngkap and Curug Cigeuntis are particularly popular. From Kampung Cipeuteuy the newly-surfaced roads leads another few kilometres into the base of the mountain range. The road ends at 320m but a farm vehicle or motorbike can continue for a further kilometre to a warung at 397m. From here, take a right past the village buildings and onto a farm track. You should see a river below you on your right. The path leads through fields and there is very little shade so make sure you cover up sufficiently. There are two huts to escape the sun’s powerful rays (466m and 504m) before you take a left turn which leads through coffee plantation. There is yet another hut at 540m and then some large trees at 620m. Just beyond the big trees is a collection of simple buildings – Mbah Berang – coffee is prepared here, there is a small shop, a couple of graves, and local people come to pray and rest here. Sangga Buana is very much a mountain for local people to pray on. The trail then crosses another open field before entering the forest at 645m. Finally some shade! Soon the trail passes some large rocks and an obvious camping area near a small river. At 675m is another hut/warung after which the trail starts to get much steeper. There is a rest area at 1,111m and a prayer shelter at 1,180m. Soon after this the first summit is reached. It should have taken no more than 3 hours to this point. This first (west) summit is actually home to a small community of about 15 or 20 people and the are several warungs where you can get a coffee, water and snacks. However, the highest point of the mountain (by about 10 metres only) is actually the narrower eastern summit which takes a further 20 minutes to reach. There are a few collapsed buildings here and a couple of cement summit markers. It takes about 2 and a half hours to descend the same way. Getting there: Take a bus to Karawang and get off at Jembatan Badami. 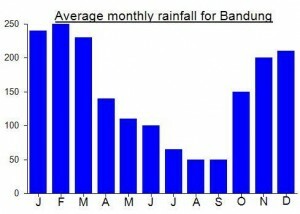 Ojeks can be arranged at Jembatan Badami. Accommodation: Most people do this as a (long) day trip from Jakarta although there will be basic accommodation available in the area. Permits: Register at the basecamp in Cipeuteuy and take a photocopy of your passport photo page just incase. Water sources: Available at 660m (shortly after you enter the forest) and at the warungs at the lower summit.